U.S. GDP will likely take a "sizeable" hit from Hurricane's Irma and Harvey, Goldman Sachs has cautioned. Hurricane Irma could have a "sizeable" impact on economic growth, Goldman Sachs analysts cautioned Tuesday, even as estimates of the storm's damage have been significantly downgraded thanks to slowing winds and a late change to its path up the Florida coast. Goldman noted that Irma's devastation is likely to be even more widespread than that of Hurricane Harvey, which pummelled the costs of Texas and Louisiana late last month, or Hurricane Katrina, the costliest storm in U.S. history, based on county-level disaster declarations from the Federal Emergency Management Agency. The bank noted that it lowered its third quarter growth projections for the U.S. economy by 0.8 percentage points to 2% but could see a further impact if damage figures were to escalate. 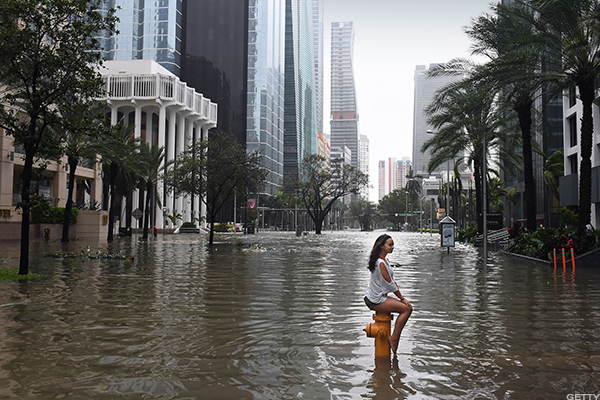 "If damages are significantly higher-or if Florida flooding continues to weigh on consumer spending and housing/investment activity into late September and October-we would expect additional downside to near-term growth," Goldman said. Last week, the bank said it could see a "meaningful drag" on key growth indicators in the near term, and predicted a possible hit to September payrolls growth of "20k-or as much as 100k if severe storm effects persist into next week (the payrolls reference period),"
"We also expect a near-term boost to headline inflation (around 0.2pp on the yoy rate) due to higher gasoline prices, and a possible modest boost to core inflation (worth less than 0.05pp), due to the destruction of some of the automotive capital stock," Goldman said at the time. Irma was described as a "major event" for the insurance industry, Munich Re board member told a conference in Monaco Sunday, but noted that his company is "not the most exposed" to the state's insurance market and the $20 billion to $30 billion costs he said the industry was likely to incur. Credit Suisse said in a client note that the bill is likely to remain under $60 billion. Last week, Fitch Ratings warned that insured losses of over $75 billion -- or another significant hurricane after Irma -- could cause "notable financial strain" on the state's reinsurers. An early indication of Harvey's impact may have come with last Thursday's jobless claims data, which showed a 62,000 surge in the number of Americans seeking unemployment benefits, taking the overall total to a two-year high of just under 300,000. Most of that gain, however, was the result of applications in Texas, which rose by nearly 52,000. Calculating the end cost of Harvey's damage is difficult, however, given that near-term loses to the economy are often offset by a medium-term boost to growth and as government support programs kick-in and private investment in rebuilding accelerates. Aberdeen Asset Management economist Paul Diggle estimates Harvey could trim as much as 0.3 percentage points from third quarter GDP figures, while gas price spikes could add similar gains to benchmark inflation figures. "Later, the rebuilding effort could actually be a larger but much more diffused boost to demand and therefore the level of GDP," he said in a client note. "Whether there is a lasting impact on GDP after this down-then-up pattern depends on the extent of permanent damage to infrastructure, which as things stand appears material."